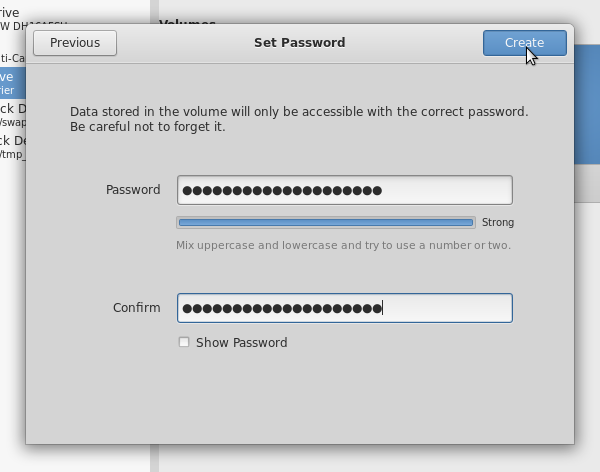 This page explains how to use gnome-disks on DICE to make an encrypted USB stick. Note that this will destroy any existing data on the USB stick. If your USB stick has files which you want to keep, copy them off the USB stick before proceeding. Insert your USB stick into the DICE machine. or by typing gnome-disks on the command line. gnome-disks will display a list of storage devices in a column on the left hand side. Click on your device (in this case an Integral Courier) to display options for your device. Delete the existing partition on the stick by clicking the - button. You should be left with a blank disk. 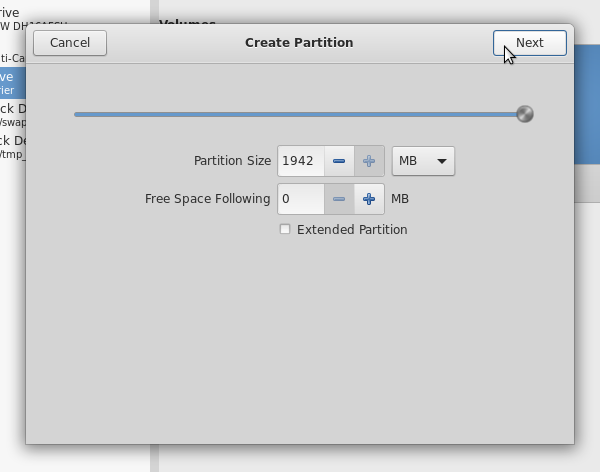 Click the + button to create a new partition. 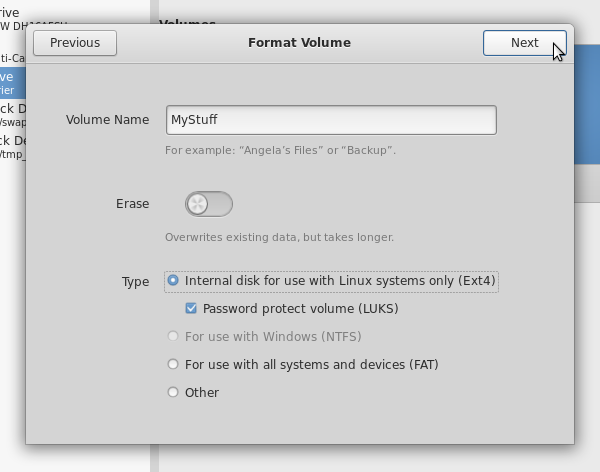 Give your volume a name and change the Type to "Internal disk for use with Linux systems, Password protect volume (LUKS)"
The encrypted volume and filesystem will now be created. This may take some time, particularly with large USB sticks, or if you chose the Erase option "Overwrite existing data with zeroes". Once the partition and volume have been created, you should see something like the following - with an encrypted partition called "Partition 1" and a volume with the name you gave earlier. Your volume should now be mounted as /run/media/username/volumename. You should be able to see your volume on the desktop. Alternatively, you can access your volume from the command line (using /run/media/username/volumename). In future, when you plug in your USB stick to a DICE PC, the following pop-up window will appear asking for your pass-phrase. If you type the correct pass-phrase, your stick will be mounted as before. The volume can be unmounted in a file browser (such as caja) by highlighting the volume (in this example MyStuff) and clicking the Eject symbol next to it, if there is one, or by right-clicking on the volume name and selecting the "UnMount" option.